Dickinson is nationally ranked and internationally recognized as a leader in global education. Chartered just days after the signing of the Treaty of Paris, Dickinson was established at the very moment when the United States entered the international community. Global study and engagement have been cornerstones of the Dickinson experience ever since. 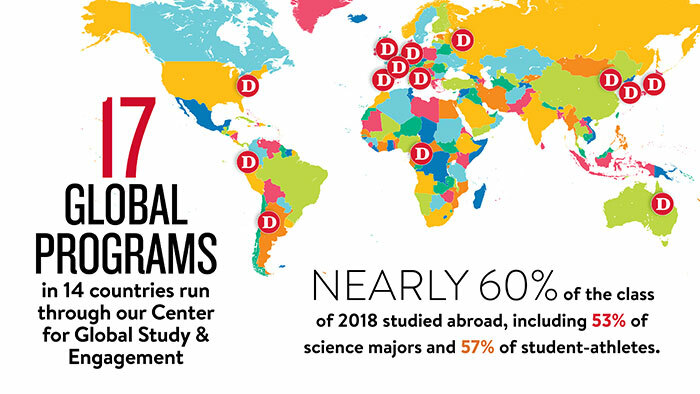 Dickinson launched its first study-abroad program in Bologna, Italy, in 1965 and has followed up with 16 additional programs in 14 countries around the world. These programs are run by Dickinson, led by our faculty members, and located outside of major tourist centers—we’re in Toulouse, not Paris; in Nagoya, not Tokyo—to ensure our students have the most useful and immersive experience possible. Dickinson received NAFSA’s 2019 Senator Paul Simon Award for Comprehensive Internationalization. We won the inaugural Paul Simon Award in 2003 and are the only institute to win the Comprehensive Award more than once. NAFSA: Association of International Educators profiled Dickinson as one of the six most internationalized campuses in country in its inaugural publication on excellence in comprehensive internationalization. Dickinson offers courses in 13 foreign languages, from Arabic and Greek to Italian and Japanese. of Dickinsonians volunteer in their communities. A sampling of the organizations that our alumni are working for or leading. Dickinson serves as the home of the Forum on Education Abroad, a non-profit national membership organization recognized by the U.S. government as the only official Standards Development Organization for the field of education abroad. Following a lengthy review, The Forum on Education Abroad noted that Dickinson’s Center for Global Study & Engagement is to be congratulated on its ongoing efforts to not only implement current best practices but also to look ahead and maintain its valuable model in light of future trends.